Meet Lil' Chillin' Snowman, this adorable stuffed snowman from the Cheery Cheeks collection. 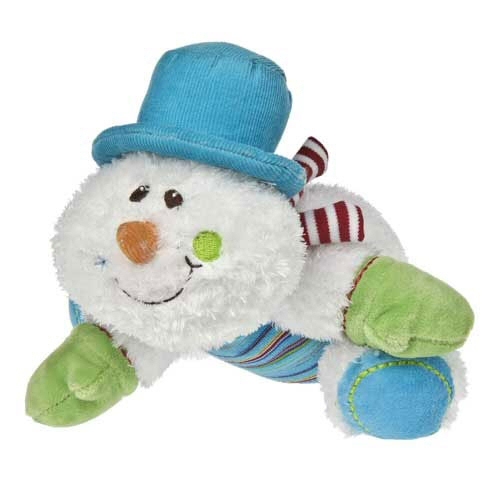 You are just going to love this amazing plush snowman with his soft white fur, orange corduroy nose, sweet embroidered face including green and snowflake cheek dots, turquoise corduroy top hat, red and white striped scarf, soft green mittens, super-soft turquoise feet, and fun multi-colored striped tummy. He'll make you smile with just a glance and once you pick him up and give his cuddly, understuffed body a hug, this stuffed snowman will steal your heart and become a most cherished friend for years to come. This Snowman giant wall decals set by Wallies lets you and your kids create a whimsical snowman and snow dog without the worry of freezing fingers.